Welcome to Lois Lane Exclusive! A small portion of the sweeping view! 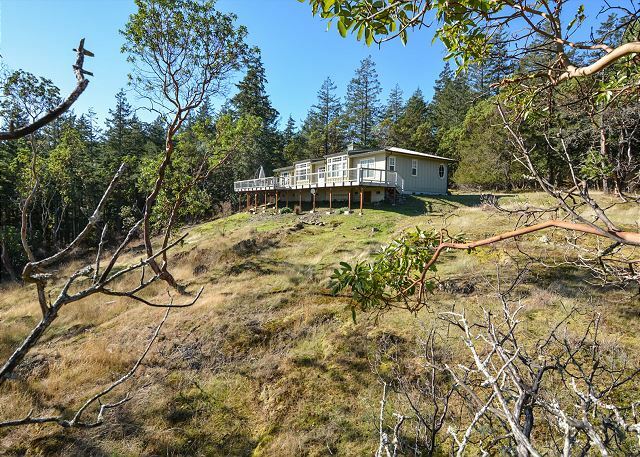 The spacious wrap around deck is ideal for enjoying the summer sun and views. A distant view of the home's beautiful and private perch. Looking to your right after entering the home you notice a cozy living room, complete with flat screen TV and gas fireplace. 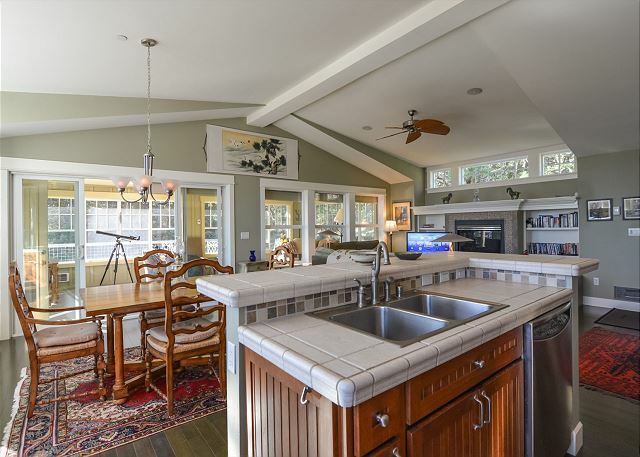 The kitchen features a large island counter with stainless steel double sink. 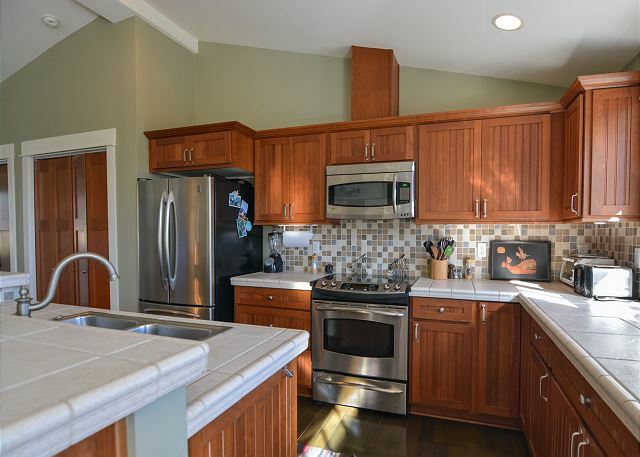 Stainless steel appliances and spacious tile counter tops grace the heart of the kitchen. The dining room table is ready for your vacation feast! 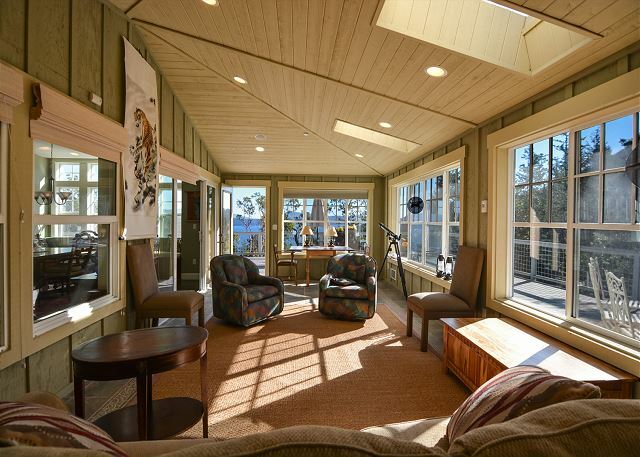 Walk through the sliding glass doors into the bright sun room, third sleeping area. Enjoy your meals with class and a view. 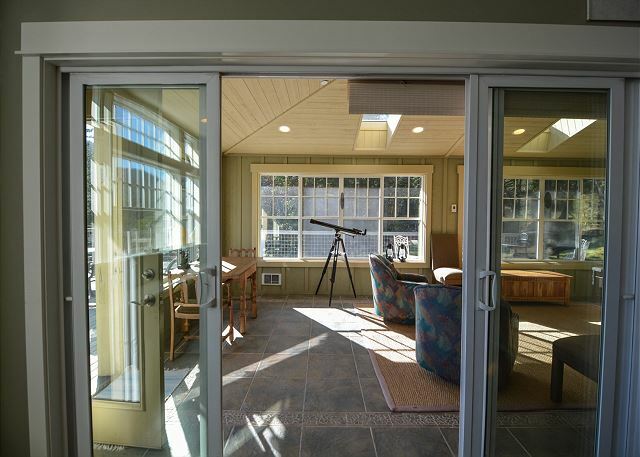 The doorway into the sun room is to the right of the dining room. 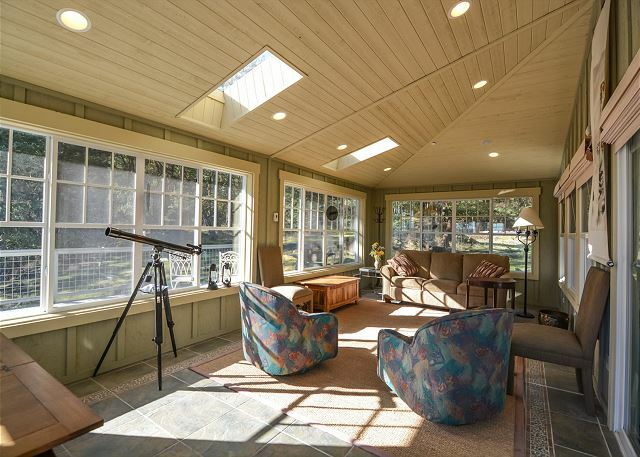 A full view of the sun room looking south toward the water view. 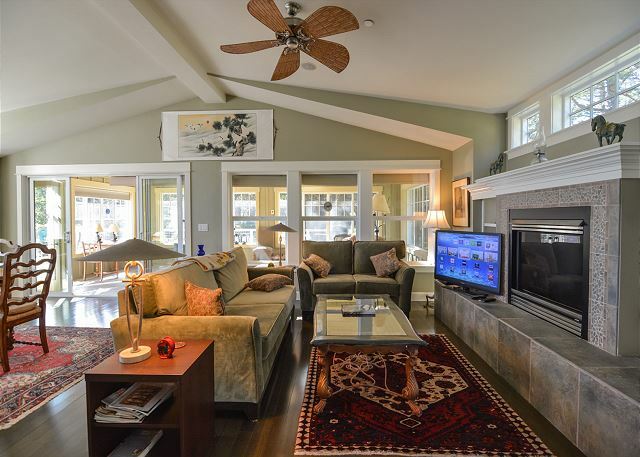 The sun room is considered the third bedroom where a sleeper sofa and air bed can be set up. 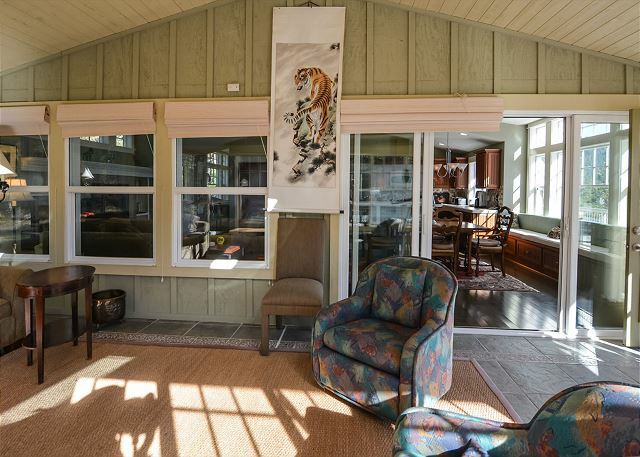 The sun room is full of comfortable seating and a sleeper sofa. Looking back toward the main living area through the sun room. 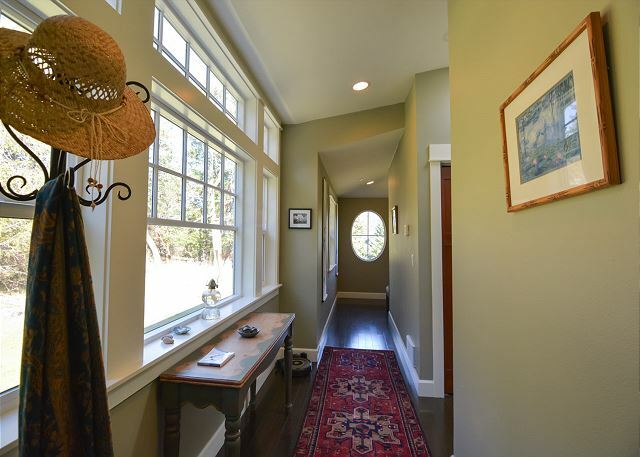 The hall way leads to the two bedrooms. The first bedroom is off the main hallway right after the bathroom. 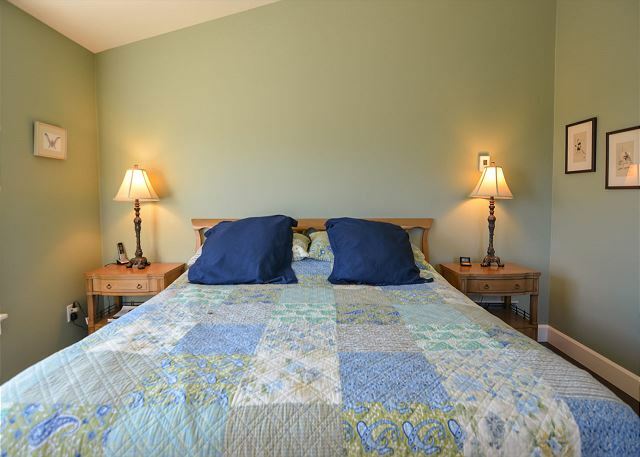 The master bedroom is located at the end of the hall. A close up look at the very comfortable master bed. 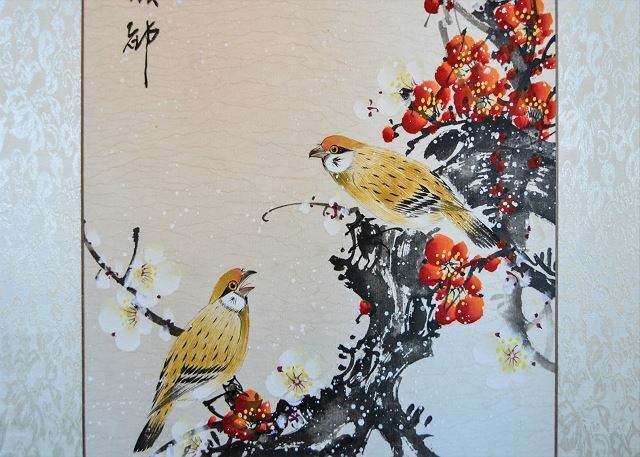 Beautiful, colorful art work throughout the home. 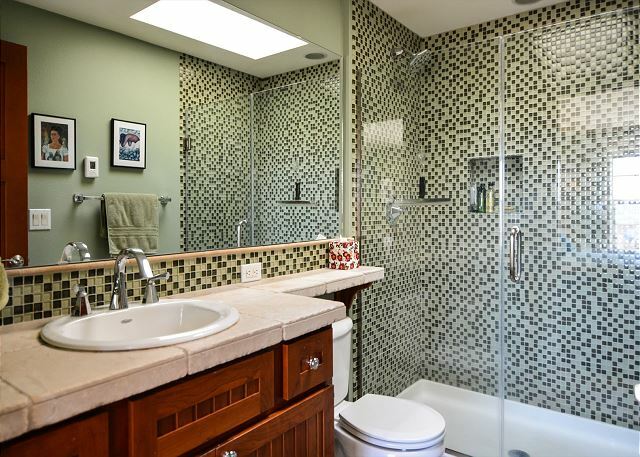 The master bathroom with glass shower door and rain shower head. One of the most beautiful aspects of this home is its privacy. 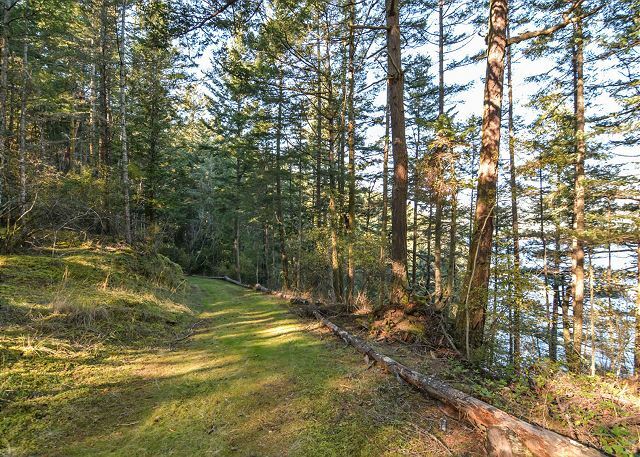 Pictured here is the grass covered road that leads from the house down to the waterfront. The end of road small private beach cove looking north. 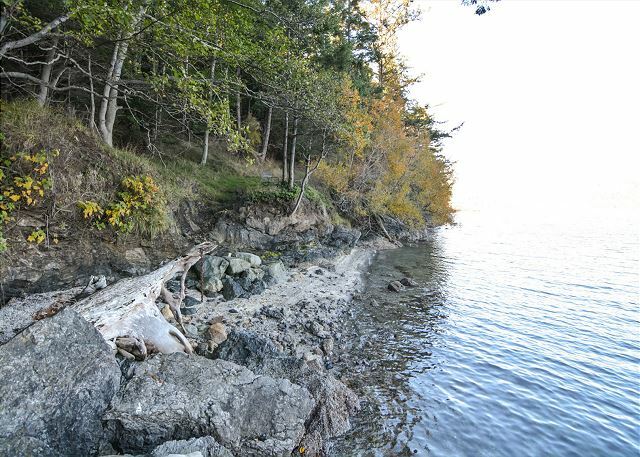 The beach cove looking south. 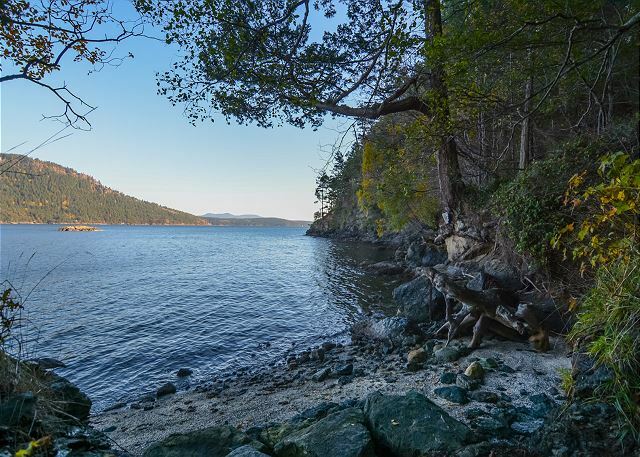 The view looking straight across Eastsound toward Mount Constitution. 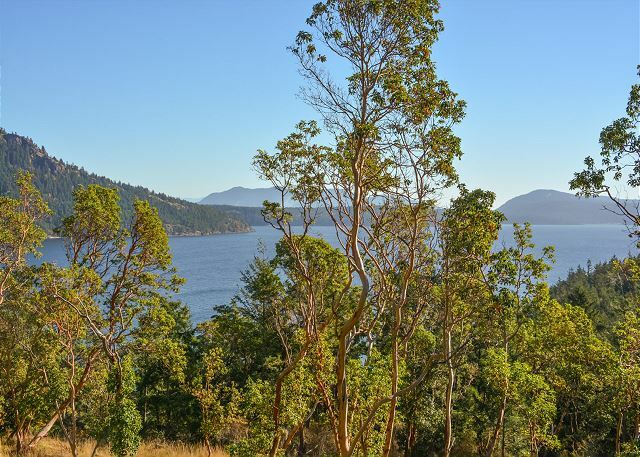 This secluded home enjoys sweeping views looking south over East Sound. The home is found by driving down the beautiful wooded Lois Lane before it opens up to the home site. 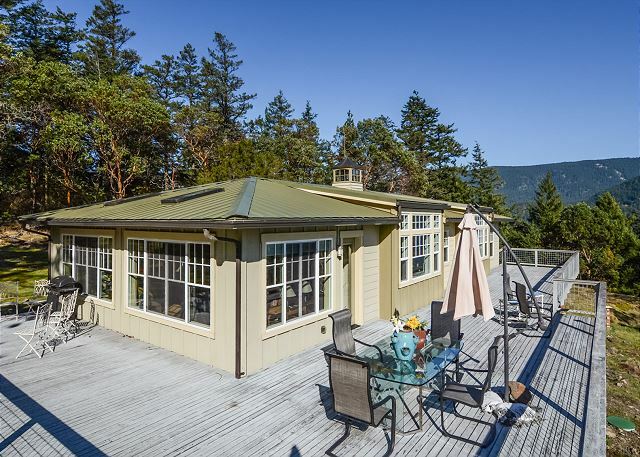 A large wrap around deck is an ideal place to enjoy the warm summer sun. When you enter the home, the spacious kitchen is straight ahead. 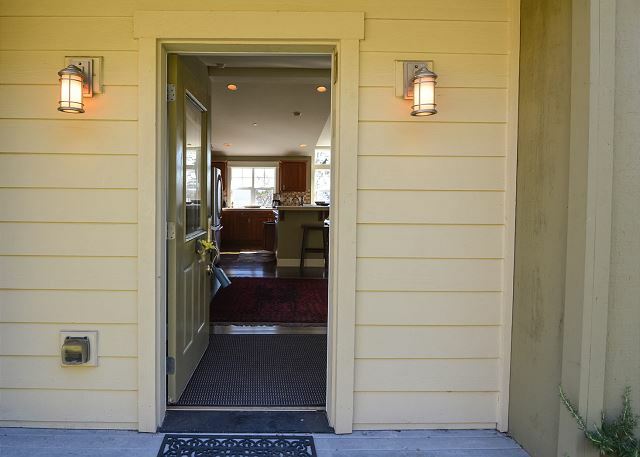 There are stainless steel appliances, a double well sink, tile counter tops and a large island. 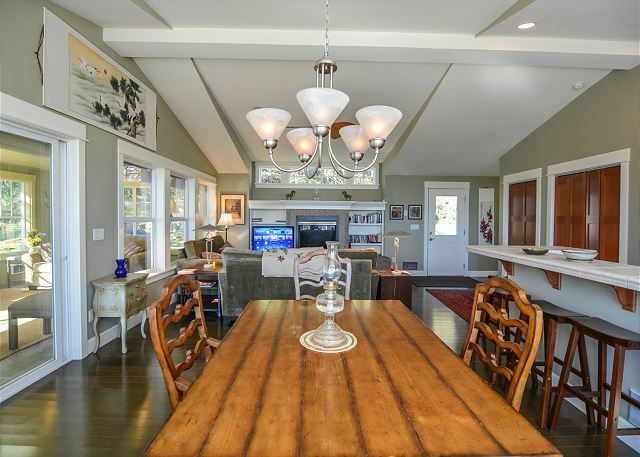 The main living area, kitchen, and dining room have an open concept. The dining room table seats four. Moving over to the living room you will notice the large screen TV and fireplace that make the comfortable seating all the more enjoyable. 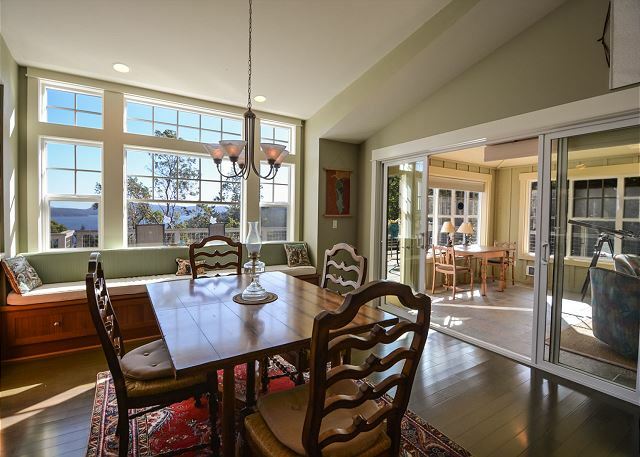 Off the dining room area are sliding glass patio doors that lead to a beautiful sun room with additional seating. 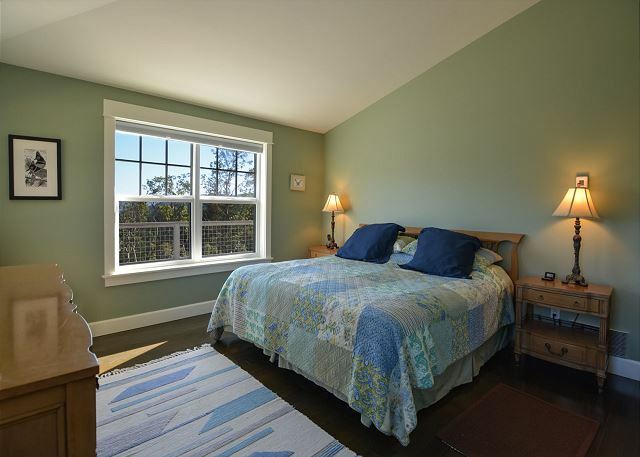 The sun room is considered the third bedroom and can be set up with airbed and sleeper sofa. Across the main living area is a hall way that leads to the bedrooms. 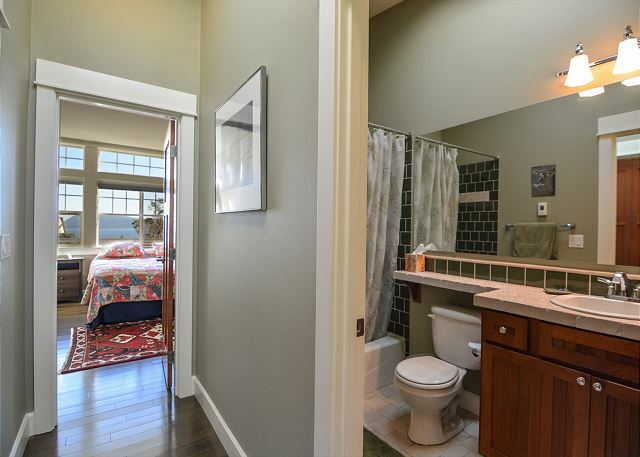 Both bedrooms have designated bathrooms. The master being in room with glass shower doors and rain shower head. 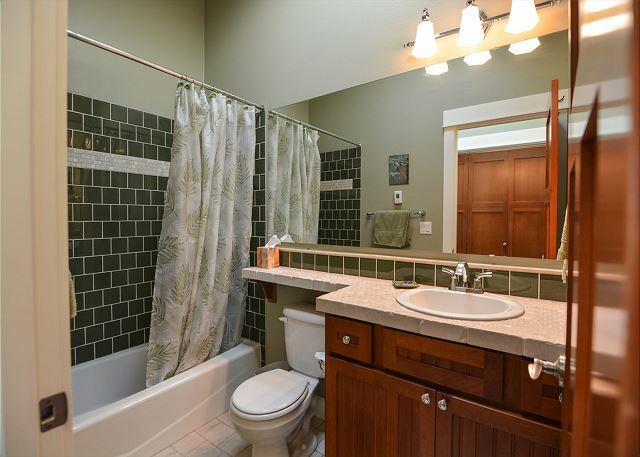 The guest bathroom being off the main hall way also features a full tub shower combination. Both rooms have king size beds and views looking south towards the water. 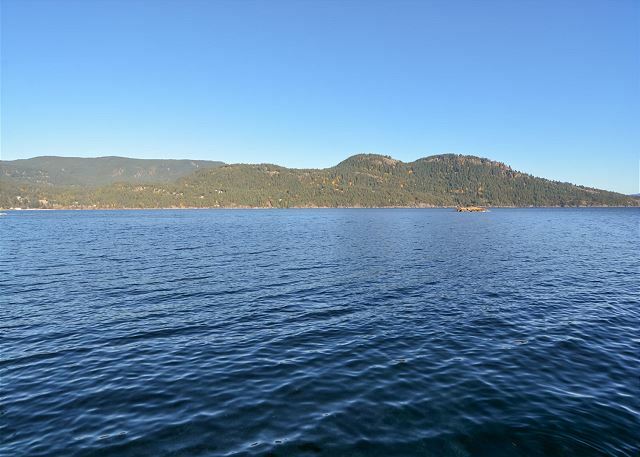 Lois Lane Exclusive offers wonderful views and a peaceful quiet island atmosphere that you are sure to enjoy. This property is beautiful. 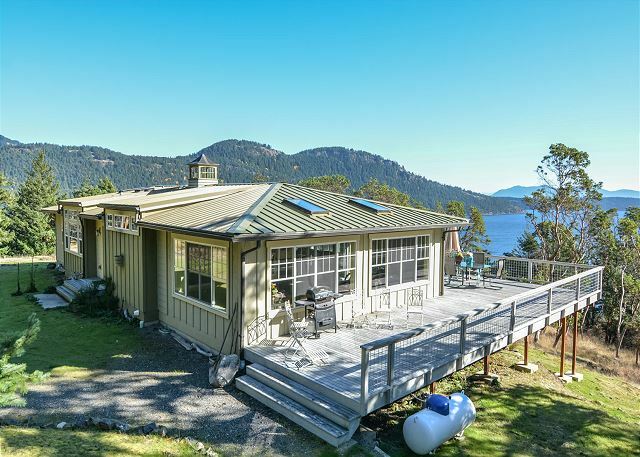 A long rural drive takes you to a beautiful home overlooking the water. 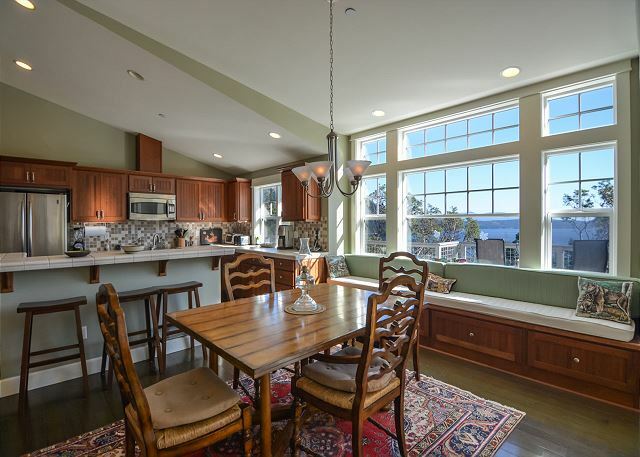 Fantastic kitchen and sitting areas overlook the water as well. Bedrooms are roomy and look out over the water. I would highly recommend this home as a great vacation getaway.